UTV Snow Plow Guide. What You Need and Where to Find a Great Deal. You're thinking about a UTV snow plow but you need some more info? What works and where do you find a great deal. That's exactly what we'll cover here. To start, you can check out this video. It was produced by Yamaha for their Rhino snow plow so there's a little propaganda in it. That being said - there's a lot of good info about snow plows in general. If you would like to see what kind of plows are available, selling prices, specs, etc., just use the link below. Best UTV Snow Plow Deals! Common UTV Snow Plow Questions. Should I even use a UTV for snow plowing? Yes - most 4WD UTVs work fine behind a snow plow. Most are capable of pushing light snow up to 2 ft. deep. Heavy or wet snow may be limited to 6 to 8 inches. The width of the snow plow blade has a lot to do with how much snow your UTV will handle. Wider blades require more power. Can I use the stock UTV tires? Depends - Most snow plow manufacturers recommend a more aggressive snow tire. But it won't hurt to try your stock tires first. Then maybe move to some tire chains and if you still need more traction - then try the snow tire. What size snow plow should I get? Plows come in several widths from about 48" up to 72". The smaller blades are good for clearing tight spaces. If you need to clear roads or large areas like parking lots, you'll need the widest blade possible. Just be aware that the larger blades will need a stout UTV to push them. A UTV Snowplow is a useful accessory for most owners. How are the plows lifted? Manual - with a long handle that provides enough leverage to minimize the effort required. About equal to lifting 25 lbs. Electric lift - the convenience of electric lifting without the cost of a winch and winch mount. Not recommended on larger or heavier snow plows. 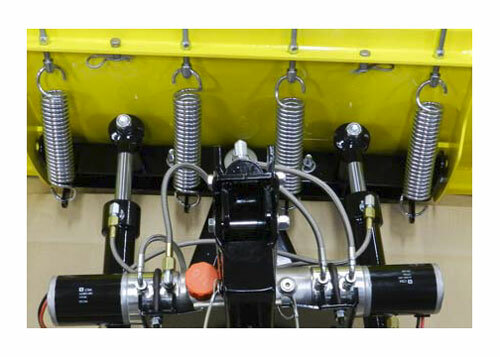 Winch - Required for heavier plows. If you already have a winch, it should work with most of the available snow plows. If you own a UTV and live in an area with snow - you probably need a winch anyway! I have a lot of wet, heavy snow. Will a UTV snow plow do the job? Maybe not. A Snowblower may be a better choice for you. You can see our Guide to ATV Snowblowers for more info. Another option may be a heavier duty snowplow with hydraulic rams for adjusting the angle and tilt of the blade while operating. These add quite a bit of complexity and expense to the plow system, but make heavier plowing much easier. Hydraulic rams make plowing heavier snow much easier. 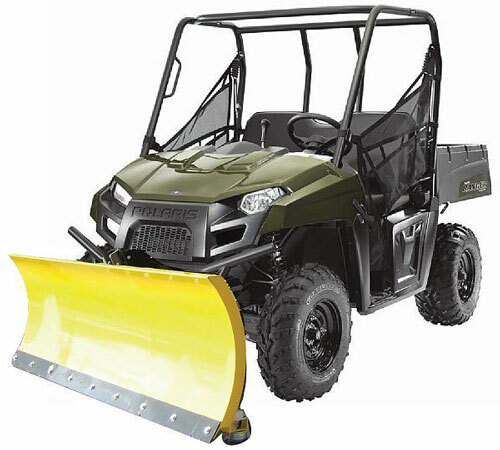 Where can I find the best prices on snow plows for UTVs? We like to at least check Ebay first. A lot of UTV dealers and accessory manufacturers list their products on Ebay. Because of all the competition, prices tend to be lower than on regular online sites. Check the link below for the best deals currently listed. Check back often because the listings are set to update constantly for the best deals. UTV Cab Best Buys - Need more protection than a windshield? You need a cab enclosure and we'll tell you all about them and where to find the best deals. UTV Windshields Guide - You've been looking at UTV windshields and now you're confused with all the choices - full, half, tilting, folding, vented, flexible, lexan, polycarbonate -what does it all mean? We explain. UTV Accessories Guide - Tons of UTV accessories on the market. But which ones really do the job and where do you get them at the best price?